Summer is finally here, Goodwill shoppers! Spring and summer have both stolen my heart when it comes to picking favorite seasons, but there's something about summer that makes me a happy soul. The Fashionable Fox loves the sunshine, being outside and enjoying days that feel much longer. I especially enjoy changing up my wardrobe and letting my colorful clothing see the light of day again. Today I'm breaking down an outfit that features three pieces from Goodwill and three top summer trends you won't want to miss out on. The first is scallops. I've seen scallops on every type of clothing piece, even accessories! Whether it's scalloped shorts, a skirt, dress, top or even a purse, there's something about the shape that is so dainty and fun. 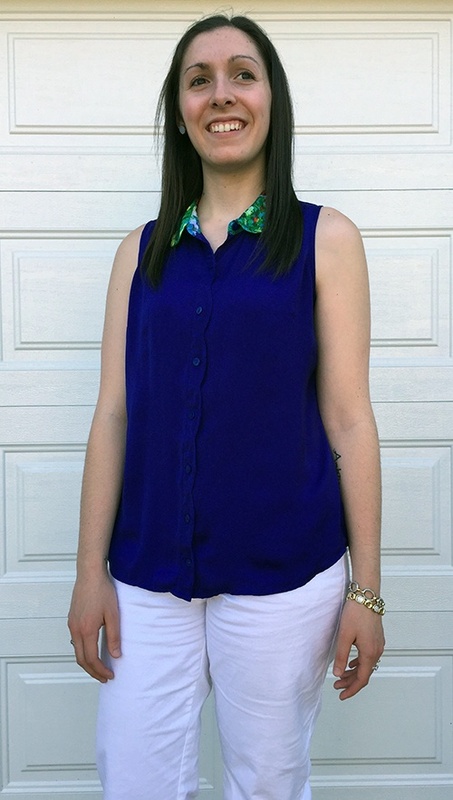 This cobalt blue L'Amour by Nanette Lepore sleeveless blouse incorporates scallops on both the collar and the button line. 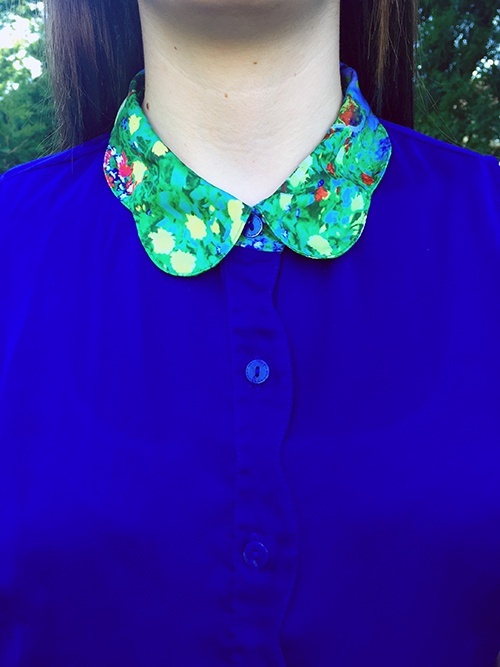 Plus, the collar is also a fun design with bright colors. I snubbed this top at Goodwill for only $2.99! The second trend is white bottoms. The color white in general has been huge this spring and summer, but white bottoms are ruling the roost. With the weather being obviously warmer, white jeans may not be very comfortable, but white chino shorts, white denim shorts or white capris are perfect alternatives. 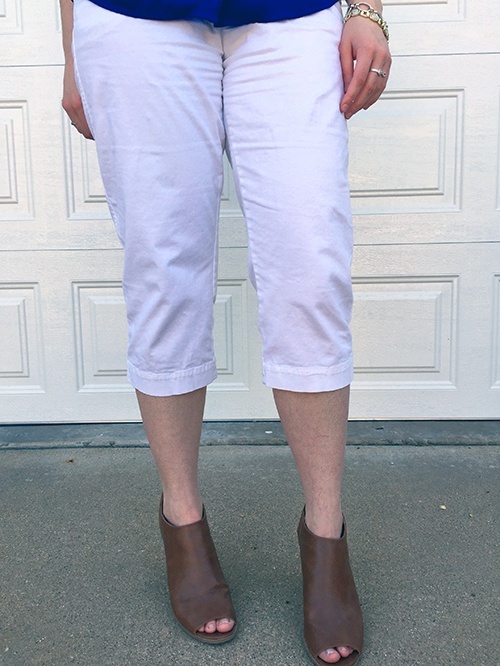 The pair of Sonoma white capris I am wearing here are comfortable, but also not too casual, so I can still get away with wearing them to work! I love the cropped style, and pairing colorful tops with white bottoms is a breeze. This pair was only $4.99 at Goodwill. The final summer trend I am discussing today is about the shoes—mules! There are so many great sandal designs throughout the summer. I'll always be a sucker for the perfect wedge! 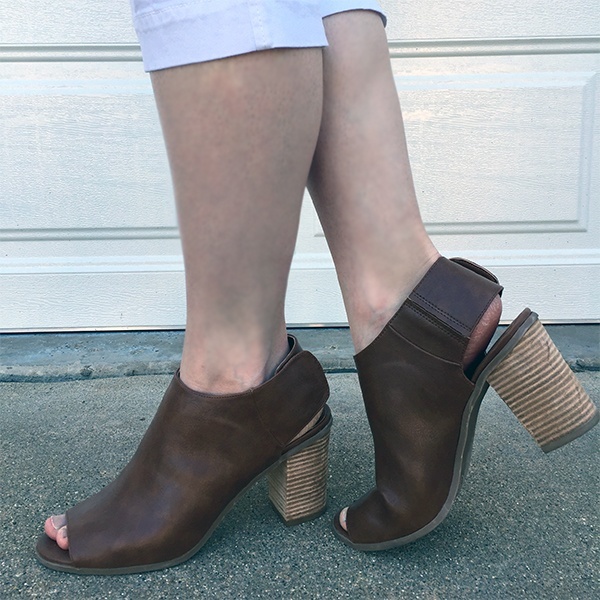 Mules incorporate a peep toe that allows them to be sandals, but the chunky block heel and covered foot style make it not your average flip flop. My brown mules are from Target originally, but I couldn't pass them up for only $4.99 at Goodwill. That's a major summer item for under $10—count me in! I already feel unstoppable in these heels. 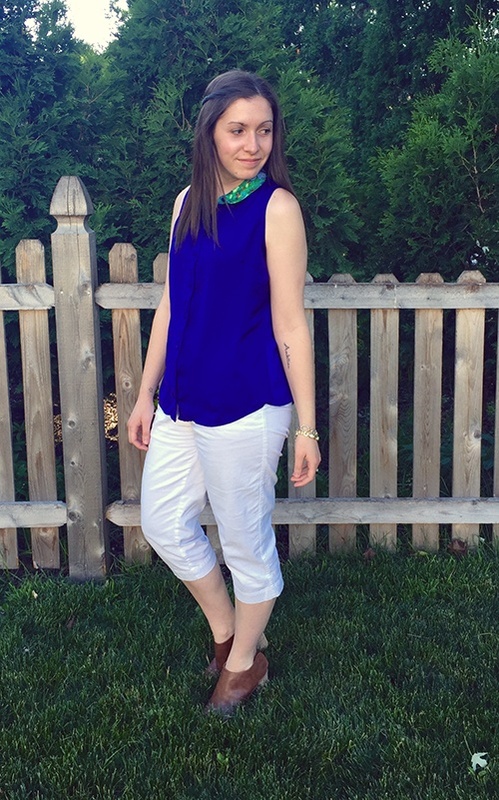 Combining all three of these trends—and Goodwill steals!—created a stylish summer look. But, the best part is these pieces are very versatile, so I can match them with different outfits throughout the season. The summer trends are hitting Goodwill's racks as we speak, so it's time to start hunting!